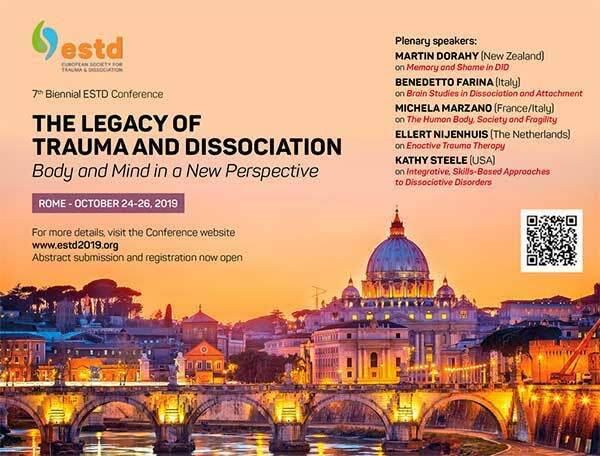 Home Corso o convegno 7th biennial ESTD conference: The Legacy of Trauma and Dissociation: Body and Mind in a New Perspective. The conference theme is The Legacy of Trauma and Dissociation: Body and Mind in a New Perspective. Plenary presentations will be given by Martin Dorahy (New Zealand), Benedetto Farina (Italy), Michela Marzano (France/Italy), Ellert Nijenhuis (the Netherlands), and Kathy Steele (United States). Abstracts are specifically sought on topics related to the conference theme, but submissions on a wide range of topics relevant to the field of trauma and dissociation are welcome.